PSVR vs. Oculus Rift: What Are the Differences? | Nerd Much? PSVR vs. Oculus Rift: What Are the Differences? The VR world is evolving more and more every day. A lot of big tech companies like Sony and Microsoft have manufactured their own VR headset. Some of these devices come with great specs and a higher price, while others are budget-friendly and less advanced. If you want to experience the VR adventure to the fullest, then you should go for a professional headset like Oculus or PSVR. In this article, we are going to make a comparison between PlayStation VR and Oculus Rift. Here you will find a lot of information about both of these great devices. According to Top Best VR, in the comparison Oculus Rift vs PSVR, the first one seems to win. However, we’ll let you decide for yourself which one of these headsets is the best. Since specs are the most important thing when it comes to VR, let’s see which one has the best. Oculus Rift has a resolution of 1080x 1200 per eye. In this department, PSVR comes close with a resolution of 1080x 960. Oculus Rift also wins at the FOV because it offers a 110-degree field of view. PSVR offers 100-degree FOV. Both of these devices are tethered and they need to be connected to a computer (Oculus) or to the PlayStation 4 (PSVR) in order to work. Oculus Rift comes with a lot of sensors and controls. It offers Tracking system, Magnetometer, and Gyroscope. PSVR comes with a gyroscope, PS eye, and accelerometer. All in all, Oculus Rift seems to take the first place in this competition in the specs category. However, you also need to take into consideration the price difference between these two. Oculus Rift does have better specs but it also has twice the price of PSVR. As we previously mentioned, both of these devices have great resolutions. When it comes to the display, Oculus Rift has a Pentile OLED display while PSVR comes with a 5.7 OLED RGB display. Both of these devices offer a very immersive view. You won’t be able to tell the difference between these two. When it comes to the controller options, both PSVR and Oculus come with 2 options. First of all, Oculus works with Xbox One controller and PSVR works with PS4 controllers. These controllers can be used for many games and apps but there are some games that require the more advanced controllers. Oculus Touch is a great controller which is perfectly designed for the VR world. This is why it is best to buy it along with the VR headset for the fullest VR experience. PlayStation Move is good also. While it is from a previous generation of gaming, this controller was adapted for VR. Setting up the VR headset can be a tricky thing, especially if you are a beginner. When it comes to the ssetupprocess, PSVR wins. This headset is simple to set up and it doesn’t take a lot of time, especially if you have the controller paired with the system. All you have to do is to go through the personalization process. Oculus Rift is a bit more complicated to set up and it takes a lot of time. You need to plug the headset into 3 inputs in the PC and then set up the sensors and controllers. Also, you need to complete the personalization process. The user experience is the most important thing. Both devices do exactly what they advertised and they offer the best VR experience. However, PSVR tends to be less comfortable to wear because it has a gap which lets you see your feet. Despite this fact, if you adjust it, it’s much better. Also, it might heat up after playing for a while. On the other hand, Oculus offers a better experience because it is more comfortable and it comes with the audio system integrated. Despite this fact, it can run into some operating problems because of your computer or the Xbox One. Those who have a PlayStation know that this doesn’t happen to their gaming system. So, for those who want a system that works without problems, it is recommended to go for the PSVR. 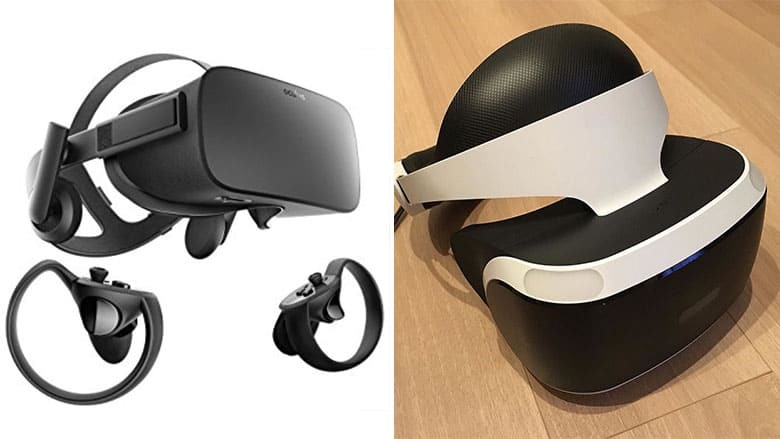 There you have it: the comparison between Oculus Rift and PlayStation VR. All in all, both of these devices are amazing. They offer the fullest VR experience you can ask for. Before you decide which one is the best for you, take into consideration their specs, their requirements, and their price.